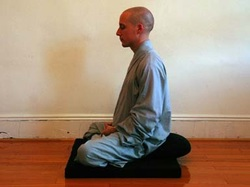 Zuo Chan (meditation) was practiced in China long before the appearance of Chan. The earlier masters practiced according to methods in the Hinayana sutras, which emphasized the techniques collectively known as samatha-vipasyana. Generally speaking, these were methods for achieving samadhi through three aspects: regulating one’s body, regulating one’s breathing, and regulating one’s mind. Please note that it is far better to take instructions from an experienced meditator/instructor, than just reading about how to meditate. Join us in our weekly Group Meditation Practice. Click on the photo to find out more about DDM's Eight-Form Moving Meditation. There are 2 versions, from a standing posture and from a sitting posture. Dharma Drum’s Eight-Form Moving Meditation was developed by Master Sheng Yen. In addition to physical exercise, practice of the Eight Forms helps you relax your body and mind, so that you can develop a healthy body and a balanced mind, incorporating the essence of Chan meditation.